I must be one of the stupidest people around, well. I feel that way after what I did in my single player world earlier, but more about that in a minute. Today I decided to try and get some more of my road finished, and it is coming along nicely if I must say so myself. 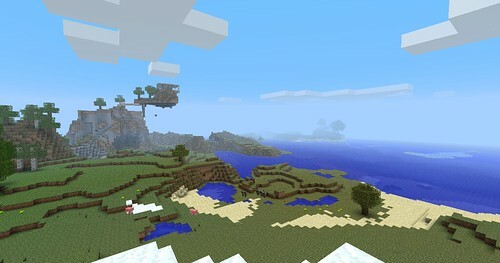 So after finishing Portal 2 yesterday morning I went back to Minecraft and booted up my server. As expected the house I built on it looks like crap, but my main goal today is to build a gigantic bridge/elevated railway to the big cave system we found over the ocean and on the other side of a hill. I was hoping to link up to a small cabin that Sqiglesheep had built over there. So after designing a mini station with the new booster tracks (and it works rather well I must say myself) I started to get together some wood and begin building this project, and even after building for another 10 minutes or so after taking these pictures the end is still far from near. I am also running out of iron for the tracks, fast. 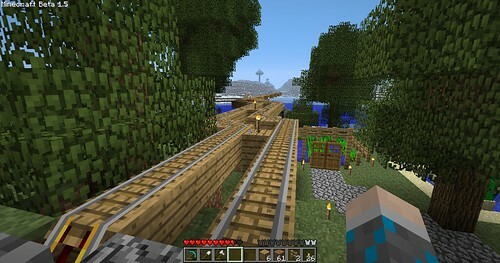 New Items (Detector rail, Powered Rail, Birch and Pine/Spruce Saplings, Web). Holding SHIFT+Click on something in a chest will immediately move the selected item(s) into your inventory and vice-versa. Crafting a ladder now produces 2 ladders. If lightning strikes a pig, it becomes a Zombie Pigman. If lightning strikes a Creeper, it becomes electrified and will have a much more powerful explosion. Yey! Thanks to all of the people buying and playing the games in the Potato Sack Portal was released aproximatly 10 hours early, meaning that it was ready and waiting for me when I got on my computer this morning at around 9 GMT. Just about. When you pre-load a game off Steam it downloads an encrypted version of it to stop people just going to the game folder and launching the game that way (I’m guessing at least one person hacked through that though) So that means when the game is released you need to decrypt it. Which takes a lot longer than I expected it to, so I’m guessing that Steam encrypted it pretty well. But yh, after waiting for about 15 minutes I loaded it up and I must say. It looks really buitiful. Especially the first un-destroyed chamber. The graphics do look a bit crappier when you get out of the chambers and into the bowels of the labs. But that cannot really be avoided as the straight, crisp edges of the chambers are obviously going to look better (and be easier to render and such) then the hilly ruins in other parts of the labs.